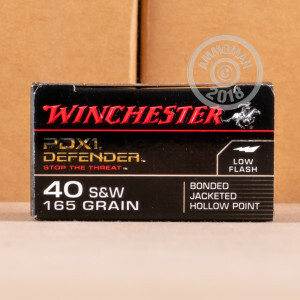 Carried by police officers and FBI agents across the country as well as countless concealed carry licensees, Winchester PDX1 Defender ammo is one of the most dependable carry loads on the market. 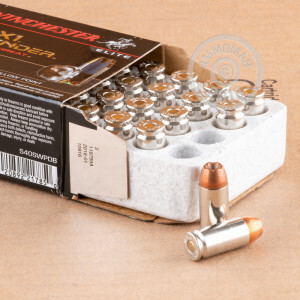 Packaged in boxes of 20, this .40 S&W ammunition from the PDX1 series fires a light 165 grain bonded jacketed hollow pont bullet at a muzzle velocity of 1,140 feet per second. This configuration produces relatively heavy recoil but also excellent expansion and penetration. In well trained hands, this hard-kicking load packs a serious punch! 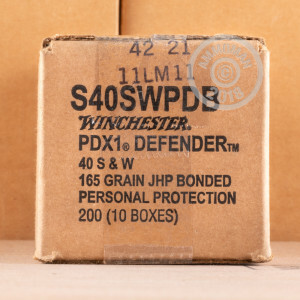 Winchester ammunition is loaded in Oxford, Mississippi using non-corrosive Boxer primers and brass cases.